Multiple AP Studio Art students scored 4s and 5s on their Nationally recognized portfolios. Congrats to Lauren Dal Santo, Alyssa Van Altena for their 5 score and Maija Beaudoin for her 4 score. 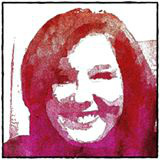 Ally Pfister PHS 2015 alum, was awarded the Gene Frett Visual Art Scholarship. The Pewaukee Kiwanis Club partnered with the Art department using Esther (Kelly) Kempen's design for the 20th Anniversary Beach Party Tee Shirt. Travel to Italy: It's Not Too Late To Travel With Us! Reserve Your Spot! The PHS Visual Art department will be traveling to Italy in summer 2016 as approved by the Pewaukee School Board. This travel experience is open to students who have successfully completed Art History, AP Art History and/or AP Studio Art. The 10 day tour will feature stops in Venice, Florence, Assisi, Ravenna, Pompeii and Rome. We have held the meeting and distributed information on the trip to Italy. If you are interested and missed this information please see the detailed webpage for more. Mr. Lamp also has printed handouts with details. 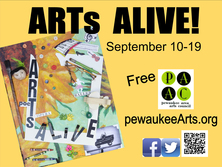 The Pewaukee Area Arts Council (PAAC) is sponsoring Arts Alive with art related events happening in and around Pewaukee in mid-September. To learn more visit their website. You can volunteer to participate or just attend the many events. For details see the fliers embedded here.